Thankfully for organisers the rain held off for the first event of a local Armed Forces Day, held to celebrate the contribution our Service personnel make to lives both here and abroad, and the sacrifices they, and their families make. Events have been held to commemorate their work and lives throughout the UK over the last few weeks and today, it was the turn of Staveley. 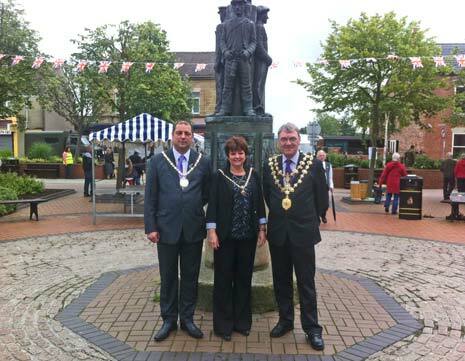 At 10am a March of Cadets and Veterans left the Market Square, led by the Mayor and Mayoress of Chesterfield and Leader of Staveley Town Council, Barry Dyke (above) and headed for Poolsbrook Country Park where two days of festivities began with the raising of the Union Jack (video below). There had been fears that the wet weather would force the event to be curtailed but, with a few changes, it went ahead with hundreds in attendance and a healthy crowd who turned out along the streets, as the parade snaked it's way past Staveley MWFC's Inkersall Road Football Ground and up to Poolsbrook Park. We spoke with the Mayor of Chesterfield at the event who, having told us yesterday how much he was looking forward to the event (one of his Charity Appeals this year), said that he was thrilled with the turn out, "The weather has held for us and it's lovely to see the Army, Air Cadets and the Veterans out today. "I should mention the Sea Cadets who have marched today - they have just started rebuilding, as two years ago we nearly lost them - they are a registered charity and don't get the same money as our Army and Air Cadets, so they need a lot of support from the public. It's nice to see the support that they've all had here today and I wish everyone a good day." Barry Dyke told us it was a proud day for Staveley and one they were proud to get involved in each year, "It means a lot to the people of Staveley as it gives them the chance to support the Heroes - past and present - and all the guys serving in the Forces and it's an honour for Staveley Town Council to support this event. "I'd like to say congratulations to the Committee for all the work they've done. It's a lot of work - a year in the planning, sleepless nights and headaches and countless forms to fill in - they've done a great job. "These events are great and get the community together and people can see the work that the Forces do. 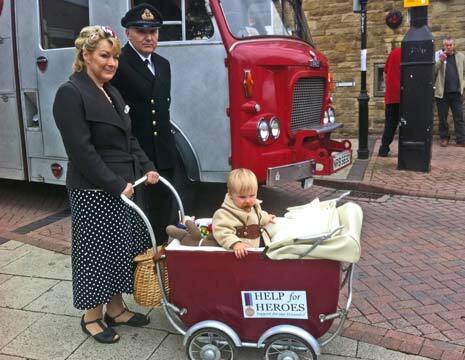 Some people don't actually realise the pressure that there is on families in the Forces." Company Sargeant Major Adams,who serves with the South Staffordshire Re-enactment Society had been the 'voice' of the parade - encouraging the Cadets to keep in step along the route and we spoke with him after the parade. He says that events like this are vital in keeping the Profile of the Armed Forces high and that they, in turn, truly appreciate the work done by organisers behind these days, "It means a lot - with the guys out in conflicts today - to know that the public back in the UK are supporting them and that we are still about, it's fantastic. "I served with the 1st Battalion Mercian (Volunteers) and they were rebadged to the 3rd Battalion of Staffordshire Regiment, which is now the 4th Battalion of the Mercian Regiment and as we heard yesterday - the 3rd Battalion Staffordshire's are to be disbanded under Service Cuts." He added that it was encouraging to see so many youngsters taking part in the day as cadets, saying, "These guys are our future and it's good to see so many out on parade here. They could be doing other things but they're here today. "The Cadets gives them a sense of purpose and discipline - after they've been with us a while, parents come back and tell us how tidy their rooms are! We teach them pride and discipline." 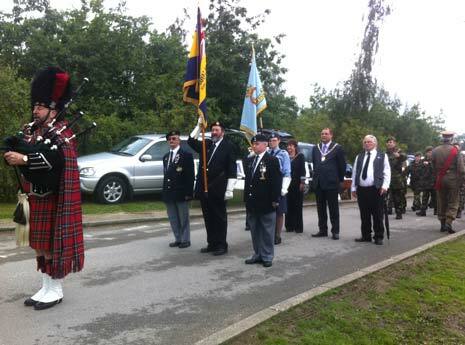 Staveley Armed Forces Day runs all weekend at Poolsbrook Country Park.